image.jpg, a photo by ladywriter47 on Flickr. Sarahs shirt goes on the wall @ 11LL. This entry was posted in Rave, Uncategorized and tagged 11LL, Piper Cub, soloing a plane, Thacker Field. Bookmark the permalink. what?a hole in her shirt makes her fit in the seat better? Back in the earlier times of flying, radio communication wasn’t installed, and the instructor had to tug on the shirttails of his/her student to get their attention from the backseat. 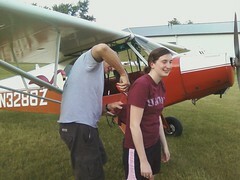 Cutting off the shirttails meant the student no longer needed the instructor to fly with him or her. No the tradition is that the newly soloed pilot “loses her shirt” after soloing. Here’s an explanation of why from studentpilot.com: In American aviation lore, the traditional removal of a new pilot’s shirt tail is a sign of the instructor’s new confidence in his student after successful completion of the 1st solo flight. In the days of tandem trainers, the student sat in the front seat, with the instructor behind. As there were often no radios in these early days of aviation, the instructor would tug on the student pilot’s shirttail to get his attention, and then yell in his ear. A successful first solo flight is an indication that the student can fly without the instructor (“instructor-less” flight). Hence, there is no longer a need for the shirt tail, and it is cut off by the (often) proud instructor, and sometimes displayed as a trophy.